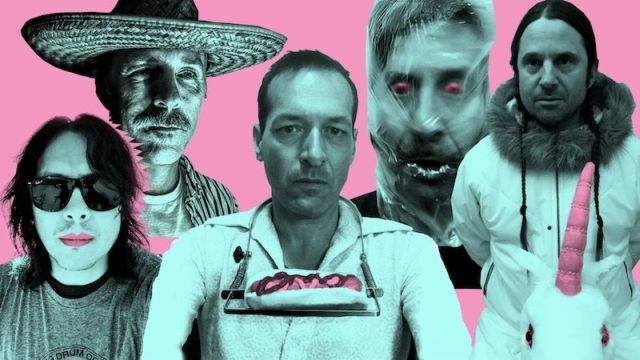 It took the punkers of Hot Snakes 14 years to bring out a new album. During the past deacde the band’s core, Rick Froberg and John ‘Speedo/Swami/Slasher’ Reis got distracted in fairly successful side projects (e.g. Rocket From the Crypt and Drive Like Jehu). Hot Snakes seemed something of the past but was revived last year by Froberg and Reis. This caused for some excitement among guitar band enthusiasts who are still trying to survive in today’s world of overproduced urban music. 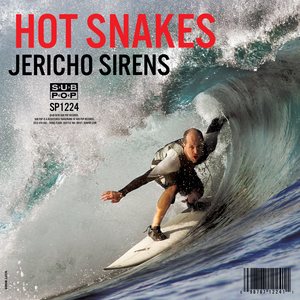 Jericho Sirens is a straightforward post-punk album with 10 songs on it and has a playing time of 30 minutes. From the first seconds on Hot Snakes make a comeback statement. Opener ‘I Need a Doctor’, is just a preface to the string of no-frills, high-energy album Jericho Sirens is. With two shredding guitars, a thumping bass, a dual drum attack and the yelping vocals of Froberg the band spits out a considerable amount of fire. As said the album keeps following this pace with fierce guitar work en bone crushing punk songs. At points the band even accelerates and brings in contradictions rhythms. ‘Candid Cameras‘ is an example of the latter. A disorientating built up of a minute and a half gives start of the album just the extra rough edge it needs. This sort of waywardness make Jericho Sirens more than a traditional punk album. The band also made room for a few steady rock songs with catchy hooks. Lead single ‘Six Wave Hold-Down’ and title song ‘Jericho Sirens’ are the most radio friendly one’s and therefore are a nice break in album’s bustle. On ‘Have Another?’ and ‘Death Doula’ the snappiness is left again for knockout punk rock with a sound that shifts between clean and raw. All together Jericho Sirens is an infurious, fierce and energetic comeback album. Froberg’s vocals shatters bones, guitars will cut you in half and the drums feel like punches in the face. It’s good to have the boys back and apparently they’re here to stay because there is more new music up for release in the near future. Bring it on Hot Snakes, bring it on. This entry was posted in WRM and tagged 'Slasher', 'Speedo', 'Swami', cd, Drive Like Jehu, hard rock, Hot Snakes, Jericho Sirens, John Reis, post-punk, Punk, punk rock, review, Rick Froberg, Rock, Rocket From the Crypt, Sub Pop, Sub Pop Records. Bookmark the permalink.